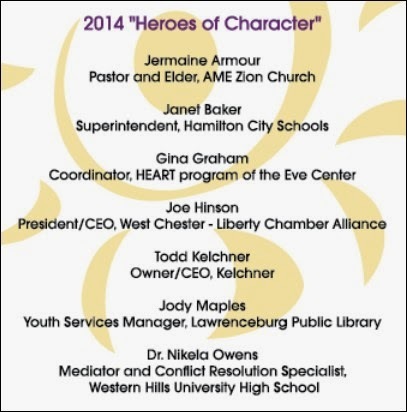 What does the screenshot above -- which advertises an awards event tomorrow evening arranged by the Character Council of Greater Cincinnati and Northern Kentucky -- have to do with the screenshot below from the March 7, 2014 Washington Post? (Bill) Gothard, the 74-year-old, unmarried man at the head of the Oak-Brook, Illinois-based Institute in Basic Life Principles (IBLP) – which brings in an estimated profit of at least $63 million annually – has been in the evangelism business since 1964. ...Although legally and fiscally independent, the CTI (Character Training Institute) is for all intents and purposes a “secular” front group for Gothard’s IBLP. In the last decade, the CTI has quietly gained entry into hundreds of elementary, middle and high schools, state and city offices, corporations, police departments and jails. 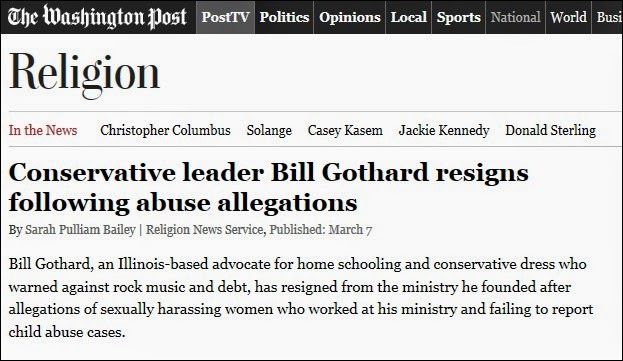 Though he never uses the term, Gothard’s ideology fits into the framework of the burgeoning “Christian Reconstructionist” movement, which aims to rebuild society according to biblical mandates. Within the Christian Reconstructionist worldview, modern-day chaos is directly attributable to the division of church and state and the consequent degradation of individual character. This book is now in the hands of most of the 1,200-strong Cincinnati police force, courtesy of a life insurance salesman and CTI cheerleader named Mike Daly who, along with Phil Heimlich, helped turn Cincinnati into a City of Character. That would be my brother Phil, a former high-profile Cincinnati elected official who in 1981, according to a Topeka, KS, newspaper, found Jesus in a Big Boy hamburger restaurant. Today Cincinnati's WLWT posted this interview with Mary Russell, longtime Executive Director of the local Character Council. She explains the "49 character qualities," but doesn't say anything about the Institute in Basic Life Principles. Last week I e-mailed multiple inquiries to Ms. Russell and asked if she'd ever communicated with Bill Gothard or any other IBLP representatives. She said no about Gothard. She didn't respond to the rest of the question. Do they or the celebrity guests know about the IBLP and Gothard conections? I'll send out some inquiries and report the results.